Chapel Farm Sponsored Junior Handler Tallulah was competing at Sandringham Game Fair at the weekend. Firstly on the Saturday in the Lintran Junior Challenge Finals with Willow where qualification had been achieved by winning various Scurry Bandits events at Living Heritage shows throughout the year. They did very well returning a fantastic score of 100/100 for first place. 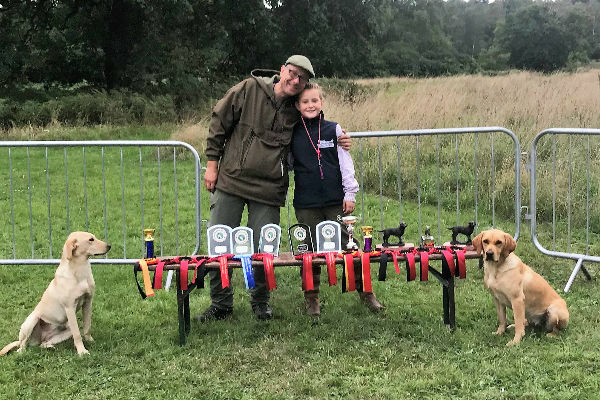 The same day they picked up a first and second in two timed events followed later by a win in the Junior Novice Test run by Marshkeeper Gundogs. On the Sunday they again won the Junior Test, had a third in the Victor Ludorum Final and two seconds and two thirds in the individual events. Dad Phil also had a good weekend picking up a first in Saturday’s Novice Test with Fern, then borrowing Willow for a win in the Open. In addition he picked up a first, second and third in other events. Phil reported that the dogs had performed very well with plenty of stamina which he put down to the Performance 24+ they are fed on. Photo shows Phil, Tallulah, Fern and Willow with the fruits of their success.